Google appears to have finally begun testing a feature that we've been waiting for ages to see — Android system updates through the Google Play Store. 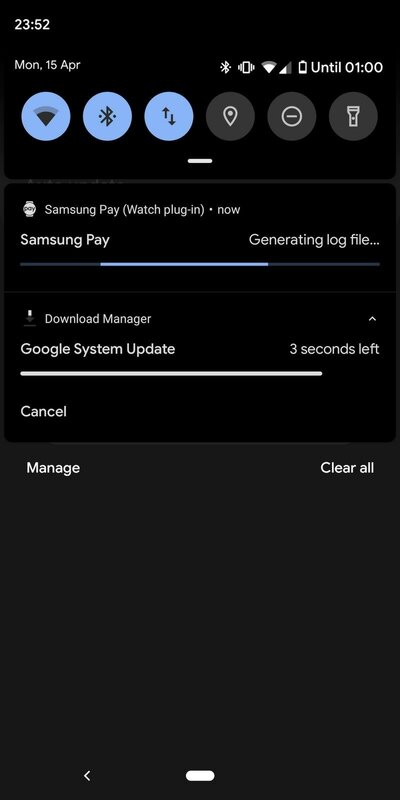 The company seems to be testing a feature on Pixel phones where the phone automatically downloads software updates from the Play Store without requiring any action from the users' end. Spotted by those at 9To5Google, a Google Pixel user using the Android Beta 2 on his device has stated on Reddit that his device received an Android system update that came with a notification pretty similar to how app updates are notified on Android. While there's no official announcement made by Google so far in this regard, it seems that Google is testing this method of distribution for fairly smaller Android updates. Complicating matters are reports from Redditors who claim that their Pixel phones restarted immediately after downloading and installing those updates. It isn’t yet clear whether that happened without any warning or permission but it can still be an ugly mess if the user happens to be working on something urgent. Of course, it’s still undergoing testing in Android Q beta, so it’s still very raw at the moment. Google is expected to release all information about Android Q at Google I/O in May 2019. Currently, Android Q is in beta test and if you are willing to try out the latest build of Android, all you need to do is register for the beta program.